Varsity Girls charge out of the blocks into the Sun. There was some hot racing at the Coach Roy Benson Double Dip Invitational Saturday morning as 28 schools faced off on the challenging Marist layout. 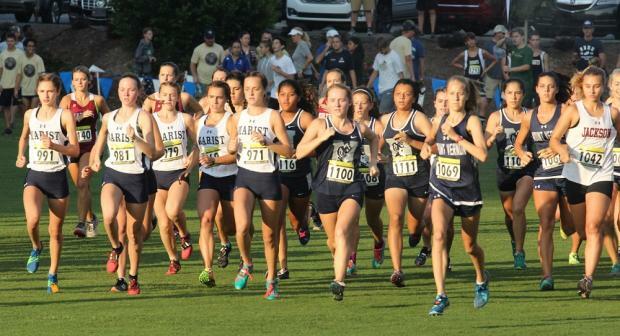 The course ran a little slower as temps quickly climbed as the Sun rose over the trees and downright brutal by the time the Freshman and JV races were contested. Leif Andersen of Marist brings it home in the shaded finish area. The Varsity boys got racing underway at 7:50am with the finish line still shaded underneath the trees. Leif Andersen of Marist ...... and won the Individual title going 16:55 to lead the War Eagles to the team title with 64 points. Also in the top 10 placing 5th was Colin O'Rielly in 17:09. The Marist Varsity Boys celebrate their team title. West Forsyth placed 2nd in the team standings, 15 points back, led by the duo of Jeremy Ericson placing 6th at 17:11 and Reece Cato 7th in 17:13. Rounding out the top 5 finishers were Mikias Mekonen of Lakeside DeKalb seizing the runnerup spot posting a strong 17:00, Ben McGinnis of Dawson County 3rd at 17:04 and Collin Kilgore from Flowery Branch 4th in 17:08. Madelyn Cadeau and Frankie Muldoon battle it out up front. 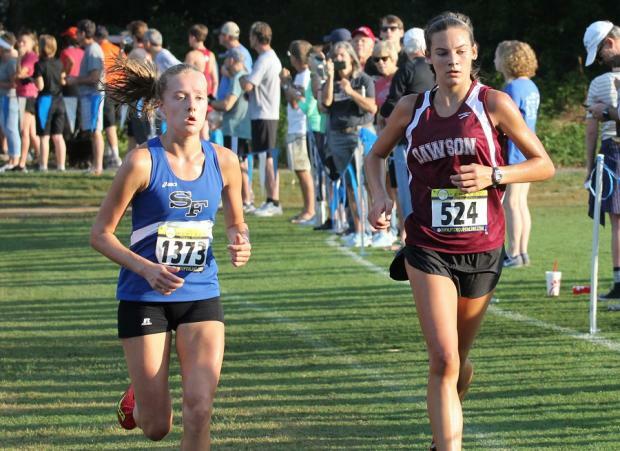 The Varsity girls race went out fast, with Senior Frankie Muldoon from Dawson County being chased by Junior Madelynne Cadeau of South Forsyth. A terrific duel between Muldoon and Cadeau for the lead continued, with River Ridge, Paideia, Lakeside, West Forsyth, and Mount Vernon in chase. Cadeau pulled out the Individual win, clocking a 19:40. Muldoon crossed the mats in 2nd at 19:52. 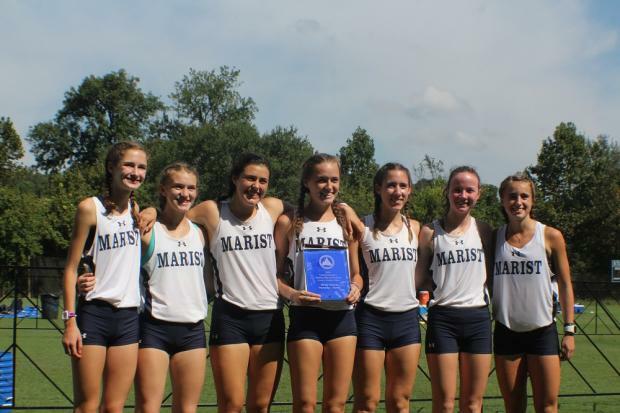 Marist Girls made it a clean sweep of the Varsity team titles. 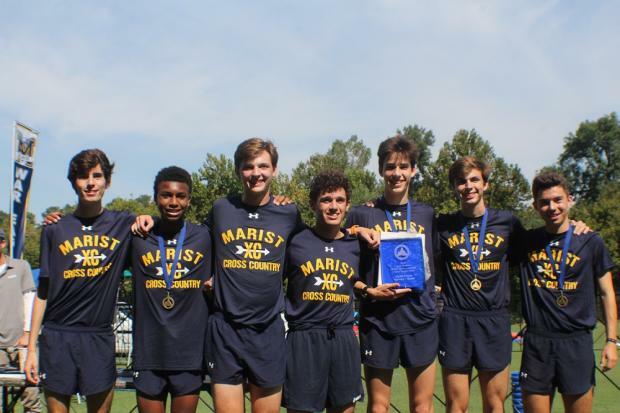 Marist ran a smart race, moving up through the ranks in the final mile and taking the team title with 45 points, 12 points ahead of South Forsyth. The Lady War Eagles swept spots 3 thru 5, including Kathleen Maley in 3rd at 20:03, Kathleen Schellman 4th at 20:05 and Lucy-Jewell Watson in 5th, going 20:08. 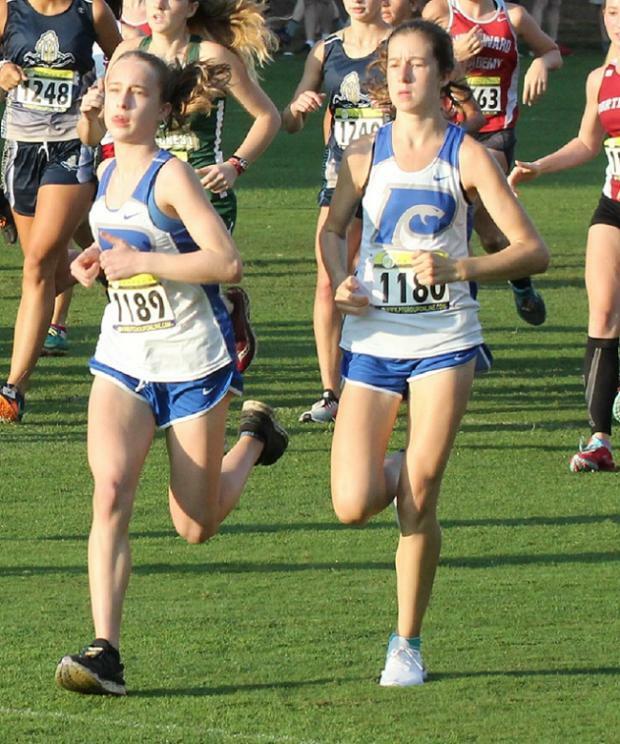 Paideia's top 2 ran well, with Freshman Luna McCauley 6th in 20:20, followed by Jordan Walter 7th clocking a 20:28. West Forsyth displayed their depth dominating the JV Boys race with 7 harriers in the top 9 spots led by Evan Castellano in 18:26. Mark Martin of rival South Forsyth was the individual winner in 18:25. Marist's JV girls were impressive, putting 8 runners in the top 10, with Emma McEvoy the Individual winner in 21:03. 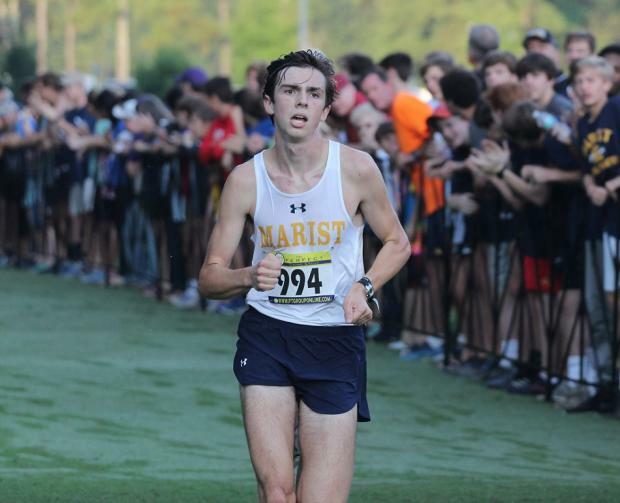 In the mixed 2 Mile Frosh race, Brandon Sertl of Holy Innocents was the titleist posting a 11:51. Marist's frosh girls got in on the act as well sweeping spots 2-5 led by Lily Murray in 14:39.